An excellent first day at the Vocus PR conference at National Harbor in Washington D.C. culminated in a meet-and-greet with keynote speaker Elisabeth Moss. 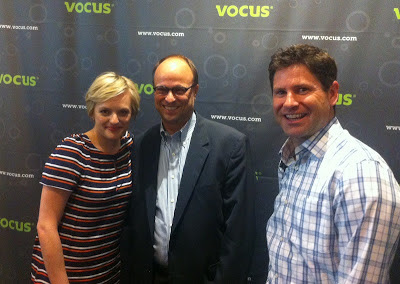 It was pretty fun for colleague Mike Smith and I to meet the famed "Peggy Olson" of Mad Men. Moss, incidentally a Scientologist, has appeared in Girl, Interrupted with Winona Ryder and 25 episodes of The West Wing. But nothing prepared her for what may be the best drama in TV history (and, if not, Jon Hamm as Don Draper is at least the greatest dramatic character, with Moss's Peggy not too far behind in the mix). Other highlights of the impressive conference were Arianna Huffington and Joe Pulizzi of the Content Marketing Institute. Legendary journalism professor Jay Rosen also gave a solid presentation on the shifting nature of the expertise.